Ryanair has warned it will grow its airline elsewhere if Stormont fails to reconvene and address the burden of air passenger duty (APD). Kenny Jacobs, chief marketing officer of the budget airline, said the £13 tax levy on every passenger was unfairly impacting on regions like Northern Ireland and "creates an economic hindrance". It comes after the airline announced it would begin a twice daily Belfast to Manchester service from October, bringing its destinations from Belfast to 13, with two more routes available from the City of Derry Airport. It offers 15 routes over the summer season direct from Belfast. APD means passengers on short haul flights flying in or out of Belfast and Londonderry must pay around an extra £13. Critics of the duty claim that it is causing a reduction in the number of potential passengers. It was axed in the Republic of Ireland in 2014. Mr Jacobs said: "Travel tax is not good for growth. On every UK flight £13 is added. That is more than a third of the price of our average fare. "Our growth here has been flat and we would like it to be more significant but that won't happen until APD is looked at." He said the lack of devolved government here was impacting on the growth of tourism and the economy because ministers could not address the issue. In Scotland MSPs voted last year in favour of reducing APD, with the hope of scrapping the tax altogether. "The evidence is there. When tax was removed in Dublin we had double digit growth. There was a strong increase in tourist numbers and if it was removed here there would be an instant boost in jobs and tourism would grow," Mr Jacobs said. "Research from PwC states if APD is cut it would boost Northern Ireland's GDP by 0.5%." 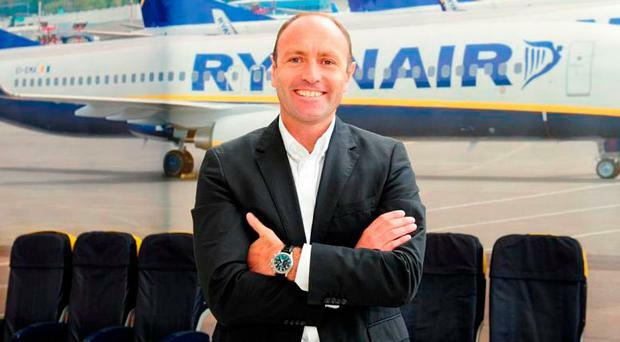 Ryanair supports 715 on-site jobs in Belfast and 110 at City of Derry. Annually it transports 955,000 passengers through Belfast and 145,000 from Derry. Mr Jacobs said: "It's a big inconvenience that we can't discuss it in Stormont and what we will say is we will grow elsewhere, where there is no tax. APD is an economic hindrance to growth in Northern Ireland." Mr Jacobs said Brexit would also pose issues for the airline but urged Stormont to address what "we know is already holding back growth". "There is uncertainty surrounding Brexit and we will need more than three years to get systems in place, so in the meantime Northern Ireland should be doing everything to boost the economy that it can," he added.